Country to test three types of missiles during military drills. Istanbul • Iran on Saturday began massive military exercises in a defiant response to a week of warnings from the Trump administration, including new sanctions, with a senior Iranian military commander calling the actions "futile" and threatening to "rain" missiles down on the country&apos;s enemies. The Iranian Revolutionary Guard Corps (IRGC), Iran&apos;s most influential security institution, said it would test missile and radar systems as part of the drill, according to the state-run Islamic Republic News Agency. And a statement on the IRGC website said that the aim of the exercise was "to showcase the power of Iran&apos;s revolution and to dismiss the sanctions," Reuters reported. "Should the enemy make a mistake, our roaring missiles will rain down on them," IRGC air force commander, Gen. Amir Ali Hazjizadeh, told the semi-official Tasnim news agency. Iran also threatened its own sanctions on unnamed U.S. individuals and companies, saying it would "take action" against those it deemed "to have played a role in generating and supporting extremist terrorist groups." The statement from Iran&apos;s foreign ministry came a day after the Trump administration announced new sanctions on individuals working on Iran&apos;s ballistic missile programs, as well as those who have helped the IRGC support U.S.-designated terrorist groups. Those sanctions were in response to Iran&apos;s successful testing of a medium-range ballistic missile last week, which the United States said was a violation of the 2015 nuclear deal aimed at curbing Iran&apos;s nuclear weapons development. President Donald Trump this week said that Iran was "playing with fire" and that Iran had been put "on notice" for the missile test. Defense Secretary James Mattis also called Iran the "biggest state sponsor of terrorism" on Friday. 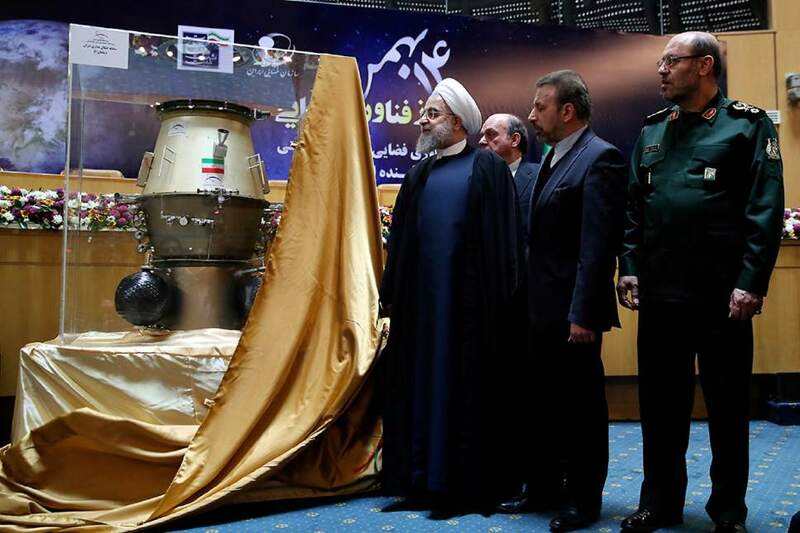 At least three types of missiles were scheduled to be tested during the drills in Iran on Saturday, the privately-owned Mehr News Agency reported, as well as radar systems and cyberwarfare technology. The drills capped off a week of rising tensions between the United States and Iran, which the Trump administration has also faulted for an attack by Iran-aligned Houthi rebels on a Saudi Arabian frigate off the coast of western Yemen. For nearly two years, the United States has supported a Saudi-led coalition in a war in Yemen that the United Nations says has killed 10,000 civilians. Experts say the escalation between the United States and Iran probably won&apos;t unravel the nuclear deal, a multilateral agreement made to ease sanctions on Iran in exchange for the country halting its nuclear weapons program. The deal was negotiated by the so-called P5+1, including China, France, Russia, Britain, the United States and Germany. "Trump is unlikely to tear up the deal and shoulder the full wrath of the international community," Cliff Kupchan, chairman of political risk firm, Eurasia Group, wrote in a briefing note this week. In addition to the multilateral deal, a follow-up resolution from the U.N. Security Council also calls on Iran to refrain from testing ballistic missiles capable of nuclear payloads. But there is disagreement over whether such tests violate the resolution. Iran insists the missile tests are part of its conventional weapons program and do not violate the nuclear agreement. Throughout his campaign for the presidency, Trump blasted the nuclear deal and vowed to renegotiate the terms. "U.S.-Iran relations will be volatile under the Trump administration," Kupchan wrote. And Trump "will likely implement sanctions more frequently." Iranian officials this week reiterated the country&apos;s right to maintain defense capabilities. Iranian Foreign Minister Mohammad Javad Zarif tweeted Friday that Iran was "unmoved" by the threats. "We will never use our weapons against anyone, except in self-defense," he said.